This 146-second exposure, captured by Europe's Rosetta spacecraft on Jan. 21, 2016, shows hundreds of dust particles rocketing away from Comet 67P/Churyumov-Gerasimenko. Following a comet around the sun is no picnic, as a newly released photo dramatically shows. 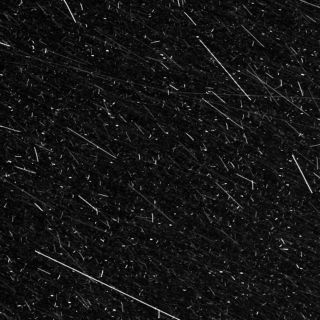 The image, taken by the European Space Agency's (ESA) Rosetta spacecraft, depicts hundreds of dust particles barreling away from Comet 67P/Churyumov-Gerasimenko, which the probe orbited from August 2014 to September 2016. Rosetta took the picture on Jan. 21, 2016 — five months after Comet 67P made its closest pass by the sun over the course of its orbit, which lasts 6.45 Earth years. The dust blizzard was doubtless much worse around the comet's closest approach to the sun, when solar energy heated the object up even more. So Rosetta's handlers backed the probe away during that time. They didn't do this to keep Rosetta nice and shiny, though. "Excessive dust in Rosetta's field of view presented a continual risk for navigation: The craft's startrackers used a star-pattern-recognition function to know its orientation with respect to the sun and Earth," ESA officials wrote in a description of the photo, which was released Sunday (Jan. 21). "On some occasions, flying much closer to the comet, and therefore through denser regions of outflowing gas and dust, the startrackers locked on to dust grains instead of stars, creating pointing errors and in some cases putting the spacecraft in a temporary safe mode," the officials added. But the dust was a blessing as well as a curse; Rosetta studied the material intently during its two years at 67P, gathering information about comet structure and composition. Rosetta launched in March 2004 and arrived at 67P in August 2014, in the process becoming the first probe ever to orbit a comet. In November of that year, Rosetta pulled off another first, dropping a small piggyback lander called Philae onto the icy wanderer's surface. The groundbreaking mission came to an end on Sept. 30, 2016, when Rosetta team members guided the orbiter to a controlled, slow-motion impact on its longtime travel companion. The time had come, ESA officials said at the time: Rosetta was getting up there in years, and the sunlight that was needed to power the probe was getting much harder to come by. Rosetta, and the comet, were more than 356 million miles (573 million kilometers) from the sun on that fateful day (far beyond the orbit of Mars), and the duo were only going to get more and more distant.